As a result of high winds, the Alaska Division of Forestry and local fire departments in Fairbanks, Delta Junction and Tok have responded to multiple reports of trees falling on powerlines and starting grass fires. There have been at least three different reports in Fairbanks, four in Delta Junction and one in Tok. All the fires have been contained thus far with the exception of the North Eielson Fire in Delta Junction, which spread to a field of grass and quickly grew in size to approximately 30 acres. 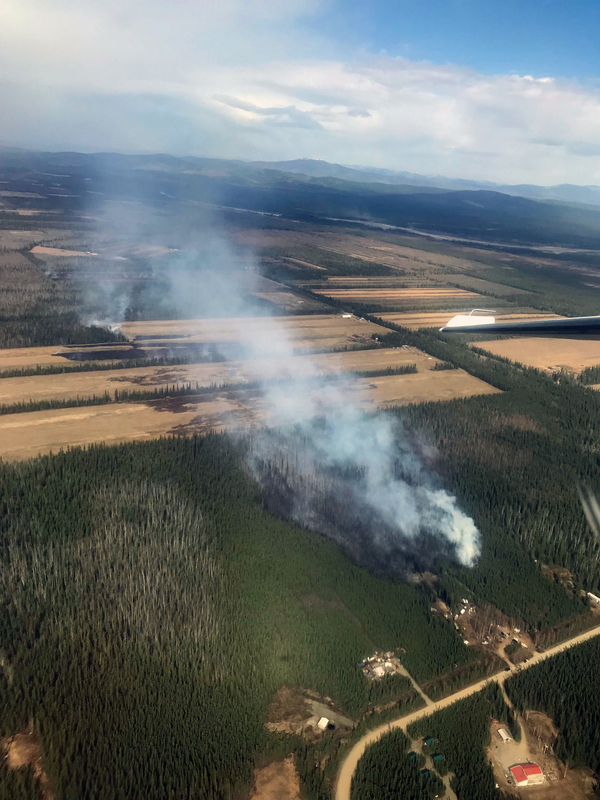 The fire jumped across three farm fields before running into a stand of mixed hardwoods not far from multiple residences on Tanana Loop Extension. However, the fire laid down once it hit the hardwoods and firefighters from the Division of Forestry and the Rural Deltana Fire Department were able to keep it from threatening any homes. A Division of Forestry air tanker from Palmer was called in and dropped at least two loads of retardant around the blaze to help keep it from spreading further. A load of eight smokejumpers from the Bureau of Land Management Alaska Fire Service were ferried to the fire in a van and a 20-person crew from Fairbanks also responded to assist with initial attack efforts. Delta Area Fire Management Officer Mike Goyette said the fire was “augured” into the mixed hardwoods and wasn’t showing signs of movement as of 5:30 p.m.
“Once it got into the solid hardwoods and trees it pretty stopped,” he said. Alaska State Troopers and the local fire department initially notified residents in the area to prepare for an evacuation but Goyette said that wasn’t necessary and no evacuations needed. The Delta Community Center was set up to house evacuees if necessary and the Deltana Fairgrounds were made available to house animals and livestock. Two additional 20-person Division of Forestry crews, the Pioneer Peak Interagency Hotshot Crew and the Gannett Glacier Type 2 Initial Attack Crew, were enroute to the fire from Palmer to assist with mop-up operations tonight and tomorrow.